Christopher Bailey's SS13 collection remains among the most joyful, brilliant (in all senses) and interesting during fashion week. 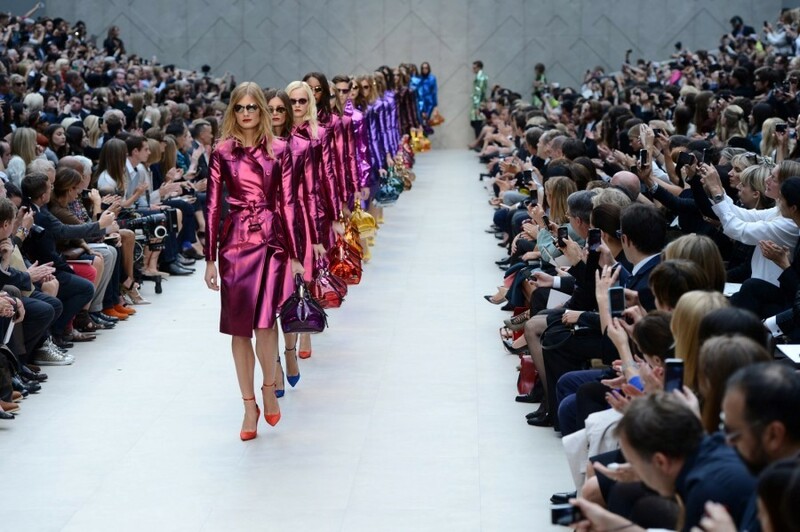 The chief creative officer's elegant vision for Burberry Prorsum borrowed heavily from past and pitched toward the future in high-tech fabrics and artificial fruit hues, proposing pod-like forms for coats, and dresses cinched to the max, proferring the exotic and sensuous. This was a collection where capes cosseted the body, defining the silhouette, often over swimwear. A lace trench-coat belted with leather or a trench-like bolero jacket worn by Jourdan Dunn over a lace body-suit featured in the mix, which ended in a Quality Street-wrapper parade of metallic silk trenches. It says something that the Frow, packed with famous faces commanding media attention, didn't detract from the commanding nature of the clothes.